Karlsruhe is an impressive German city near the Franco-German border that was built in the 1700s. The city was built radially around its palace, which earned it its nickname “fan city” (Fächerstadt). It can be reached by train and long distance buses, and there are several airports in the vicinity for international travellers. Karlsruhe is connected to the A5 (north-south), A8 (east), A65 (north-west) and B9 (north to north-west) freeways. Note that A5 and A8 can be heavily congested during early morning and late afternoon. For cars entering the city center an emission sticker is required. Failing to have a valid emission sticker (green) attached to the car might result in a fine of 80 €. You can check the borders of the “Umweltzone”, the area requiring an emission sticker, on this map. In general driving in the city center of Karlsruhe is not adviced even if you have an emission sticker and public transfort is often the better and easier solution. You can leave your car for free at Waldparkplatz close to the venue outside of the “Umweltzone”. Karlsruhe is well connected inside Germany and also to France with TGV connections to both Paris and Marseille. When travelling using long distance trains the relevant station is Karlsruhe main station (“Karlsruhe Hbf”). Check for trains going to “Karlsruhe Hbf” on the website of Deutsche Bahn. For trains from France try the SNCF. Deutsch Bahn offers much cheaper tickets (“Sparpreis”) for destinations within Europe, if you book your ticket up to 91 days in advance. Should you be in a group of six or more people it can be even cheaper to get a group ticket. These tickets are only valid with an identification document (e.g. a credit card) and it is mandatory to use the specific connection that you choose at the time of booking. For people arriving by air you can also check with your carrier whether you can get Rail&Fly tickets (IATA: QYG) which include any long distance railway trip in Germany. Please note that Deutsche Bahn tickets are generally not valid as local transportation tickets. Rail&Fly tickets are valid on the connection to and from Stuttgart Airport (S2 and S3). Frankfurt International Airport (FRA) is Germany’s busiest airport and an important hub for international air travel. About 55 airlines are flying to over a 100 destinations from Stuttgart airport. It is reachable both by S-Bahn and train or using far distance buses. Karlsruhe Baden Airpark is a small airport located to the south of the city. It mostly hosts cheaper airline companies flying to holiday destinations throughout Europe. This airport located just south of Strasbourg can easily be reached from Karlsruhe using local trains. 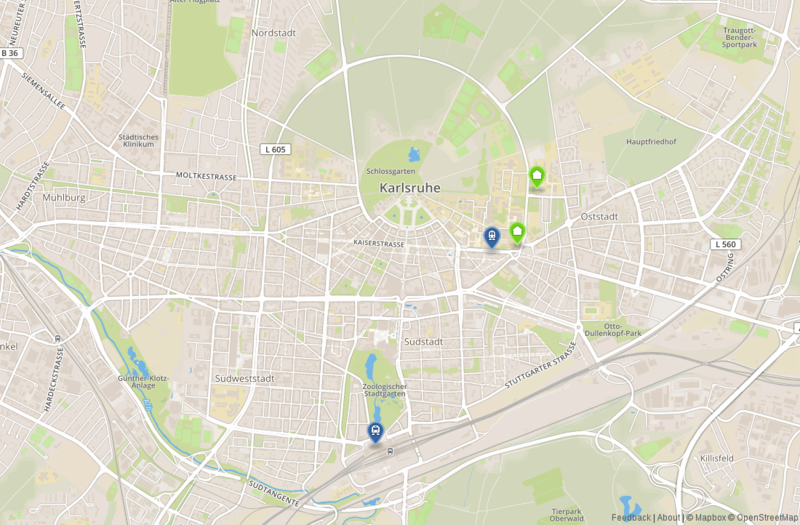 Venue in green and Karlsruhe main station and the tram stop closest to the venue in blue. We can provide assistance for your Visa application by sending you an invitation letter. You are required to provide proof that the purpose of your travel to Germany is GUADEC.